Two bombings in Brussels have killed dozens of people and injured over 100, only days after one of the Paris attackers was arrested in the city’s Molenbeek suburb. The Islamic State (ISIS) has reportedly claimed the attack. As they recover from the shock of the attacks, people are asking why this happens, and who the people carrying out these suicide missions are. That such attacks could be launched from inside a European country once again calls attention to a serious crisis: the radicalization of citizens outside the Middle East by extremist groups. The actions of the shooters like those in San Bernardino, Paris and very probably Brussels are difficult for most people to understand. But the work of scholars specializing in extremism can help us begin to unravel how people become radicalized to embrace political violence. Security experts Alex Wilner and Claire-Jehanne Dubouloz define radicalization as a process during which an individual or group adopts increasingly extreme political, social or religious ideals and aspirations. The process involves rejecting or undermining the status quo or contemporary ideas and expressions of freedom of choice. Newly radicalized people don’t just agree with the mission and the message of the group they are joining; they embrace the idea of using violence to induce change. And some members of these groups become radical enough to actually get involved in violent operations personally. So how often does this radicalization process happen in the U.S.? As of the fall of 2015, US authorities speak of some 250 Americans who have traveled or attempted to travel to Syria/Iraq to join the Islamic State in Iraq and Syria. The report goes on to say there are some 900 active investigations against ISIS sympathizers in all 50 states. As a result of these active investigations, 71 suspects have been charged for terrorism-related activities – and those charged share some interesting characteristics. The average age of the suspects is 26 years, and the vast majority of them (86 percent) are male. About 27 percent were involved in a plot to carry out violence on U.S. territory. The suspects are diverse in terms of race, social class, education and family history. Forty percent of those arrested are converts to Islam. A large majority – 58 out of 71 – are American citizens. Countries in the Arabic Peninsula have the highest rate of ISIS sympathizers, but the number on U.S. soil is higher than many would expect. A group like ISIS attempts to grow its number of supporters from the mass population by using propaganda. Here social media plays a crucial role. Take the example of the Australian physician who now serves in a hospital run by IS in Raqqa, and serves as a recruiter on YouTube. Other facilitators like this doctor might provide different types of support – such as financial, logistical, technical or material. 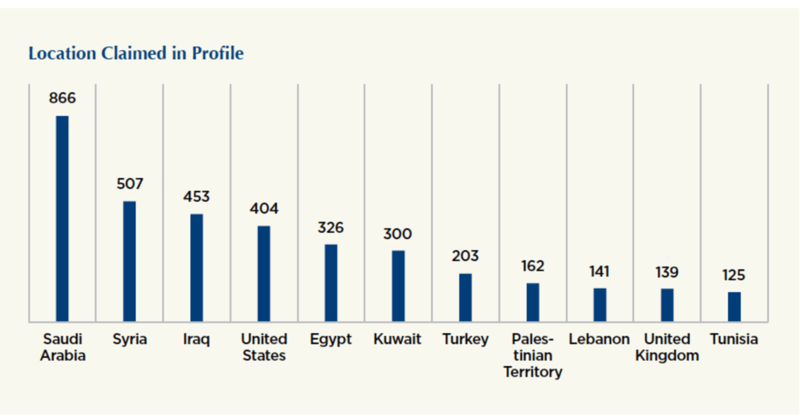 A Brookings Institute report, The ISIS Twitter Census, uses social media metrics to map the geographical distribution of IS supporters. It also reveals tweeting patterns, follower ratio and the number of accounts followed. The most interesting finding shows that the U.S. is fourth in the world and the U.K. 10th for IS-supporting Twitter users who can be located. 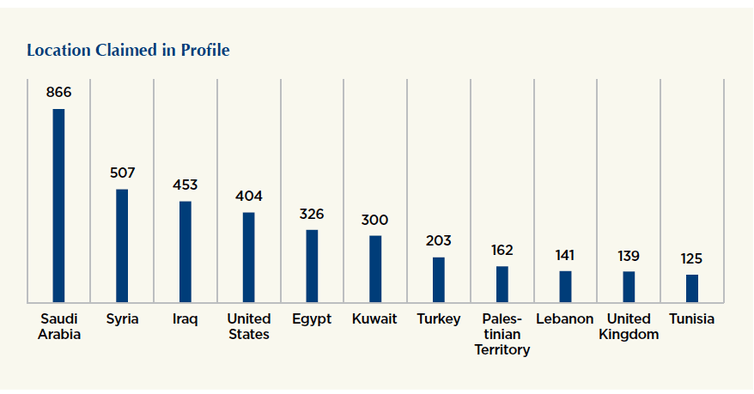 While these numbers are small set against the total number of Twitter accounts connected with ISIS (46,000), they still indicate a surprisingly strong online support base for ISIS in these two countries, which are clearly high up ISIS' target list. The findings from these two reports also highlight some of the key recruitment and radicalization mechanisms use by ISIS. The work of psychologists Clark McCauley and Sophia Moskalenko provides a good model for understanding the types of people who are most likely to be attracted to the message ISIS is selling. Like Sunnis in Syria or Iraq who have been victimized by those countries' governments, among the key targets for radicalization are individuals whose political grievances can’t be channeled into an existing political system. One example is the Canadian citizen who left his country to be part of what he views as a utopia: the restoration of the Caliphate. Once they’ve joined up, individuals may stay engaged in terrorism activities because of the power of love between individuals. The Paris attacks were undertaken by two brothers and two cousins. The attackers in San Bernardino were husband and wife. The Boston bombers were brothers. The suffering of marginalized people under particular regimes is another key factor. Between 2011 and 2013, Iraq saw a serious rupture between the Sunni and Shiite communities. The government of Nouri Al-Maliki, who is Shiite, had Sunni political leaders arrested and Sunni soldiers removed from the army. Excluded from the institutions of the Iraqi state, which did little to keep them safe, many Sunnis decided to join ISIS, which was filling a security vacuum. Meanwhile, in Western countries like France and the U.S., the isolation of still-excluded Muslim communities makes disenfranchised youth ripe for radicalization. Competition between terrorist groups can further increase radicalization inside violent groups, leading to more and deadlier attacks. Over the past several years, for example, ISIS has stood up against al-Qaida, defying its leadership and competing for support from the same demographics. Immediately after the Paris attacks, which were planned and perpetrated by ISIS, al-Qaida claimed responsibility for an attack on a hotel in Mali. The direct competition between the states of Iraq and Syria and ISIS for the control of territory and oil resources leads only to more violent struggles and the need to attract more fighters from foreign countries. Violent groups like ISIS use jujitsu-style strategies, exploiting the reaction of their adversaries to their advantage when they attack Western targets. Governments in countries such as Belgium, France, the U.K., Russia and the U.S. play into their hands by ordering large-scale military retaliation and stirring hostile anti-Muslim political rhetoric. These reactions help extremist groups improve cohesion in their ranks and rouse support from their target audiences. Addressing the rank and file, ISIS uses hate discourse to dehumanize its opponents and devalue their lives. This perception of Westerners and nonbelievers justifies acts of extreme violence such as beheading foreign hostages such as Japan’s Kenji Goto, persecuting of Coptic Christians and burning alive prisoners such as Jordanian pilot Moath al-Kasasbeh. When their own followers die, ISIS uses martyrdom as powerful tool to convince the target audience that the cause is worth suffering and dying for. Martyrs become heroes who are publicly celebrated and recognized on the Internet. So, can we expect ever more people around the world to be radicalized to join ISIS? The outlook is mixed. Despite the successes of its recruitment and radicalization campaign since 2011, recent media reports show that IS is struggling to integrate different groups of foreign fighters into its combat forces in the Middle East and North Africa, raising the prospect that competing loyalties could fracture the group and undermine its ability to project an appealing recruitment message. As far as the fight against IS recruitment goes, this is a ray of hope. But there’s plenty of bad news too. Counterpropaganda strategies deployed by the US on the Internet have been criticized as ineffectual. According to the Rand Corporation, deradicalization programs have had mixed results. And as the recent attacks in Europe, the U.S. and elsewhere sadly demonstrate, the resources to fight radicalization are often simply not there. Frankly, we don’t have the infrastructure to properly investigate or monitor hundreds of individuals suspected of terror links, as well as pursue the hundreds of open files and investigations we have.